Tamiya's follow-up release to the Meteor F.1 is the 1/48 scale Gloster Meteor F.3. The F.3 replaced the F.1 with the addition of Rolls-Royce Welland jet engines, a modified canopy, and increased fuel capacity. 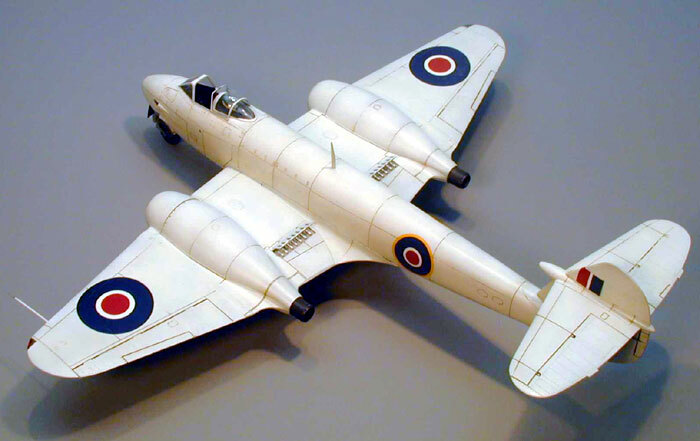 Unfortunately, the first 15 F.3 Meteors of the 210 production models were equipped with the original Derwent engines due to Welland production delays. At least four of the original production run had the standard camouflage pattern over sprayed with a distressed white color to prevent it from being mistaken for the Me-262. When the "Meatbox" F.3 took to the sky, the Luftwaffe's strength was significantly weakened. Thus, the Meteor never engaged the 262 in aerial combat. The Meteor F.3 was active through the end of WWII in the role of reconnaissance and air-to-ground combat duties.